Recently, some Albertans have argued that democracy in Alberta might be better served by a realignment of the current political parties along “natural” ideological lines, into what might perhaps be called right-wing and centre-left- wing “tribes.” While voting preferences can shift with issues and party leaders, values and beliefs tend to be more durable. This report uses polling data from the 2014 Alberta Survey to examine the range of political values and beliefs among Albertans on four dimensions – economic conservatism, traditional values, libertarianism, and political alienation – to see whether these line up in the manner some have suggested. Public opinion polls conducted by the University of Alberta’s Population Research Laboratory (PRL) between 2012 and 2014 showed a decrease in those identifying a party preference. The same polls also revealed that, among committed voters, the political preferences of Albertans were shifting substantially away from the governing Progressive Conservative (PC) party towards other parties, particularly to the Liberal and Wildrose parties. The survey results suggest substantial variation in each of the four areas examined across groups of voters with different party preferences. In general, Wildrose supporters are more economically conservative than are PC supporters. For example, they are much more likely to strongly agree that “private industry is always more efficient than government.” Wildrose supporters do resemble PC supporters, however, in their general nonsupport for the libertarian values we asked about in our survey (legalization of prostitution and marijuana). On budget issues, Wildrose supporters stood out prominently from the other major party respondents in their belief that the province has a spending and not a revenue problem. Less than half of the supporters for the three other major parties, along with the undecided voters, believed this to be the case. By contrast, far less than a plurality of supporters for any party believed that Albertans get a fair return on the royalties charged to oil companies. With the exception of these libertarian values, the political values and beliefs of PC supporters otherwise resemble as much, if not more, those of Liberal supporters and the uncommitted as they do the values and beliefs of Wildrose supporters. This finding raises the interesting question whether the PCs, instead of welcoming Wildrose members into their “big tent” this past fall, might have gained an equally significant political advantage by attempting to attract more centrist voters. In contrast, NDP supporters are quite different from Liberal supporters (and also PC and Wildrose supporters) in a number of ways, but in particular with respect to economic conservatism. For example, only slightly more than one in ten NDP supporters felt that Alberta was receiving sufficient royalties for its oil resources, compared to 30% or more of Liberal, PC and Wildrose supporters (even though this is still a small minority). Finally, the values and beliefs of the small group of Green/Alberta Party supporters (predominantly Greens) appear to be more like those of NDP than Liberal supporters. This finding is at variance with suggestions that Green and Alberta Party supporters might find a natural home within the Liberal party. 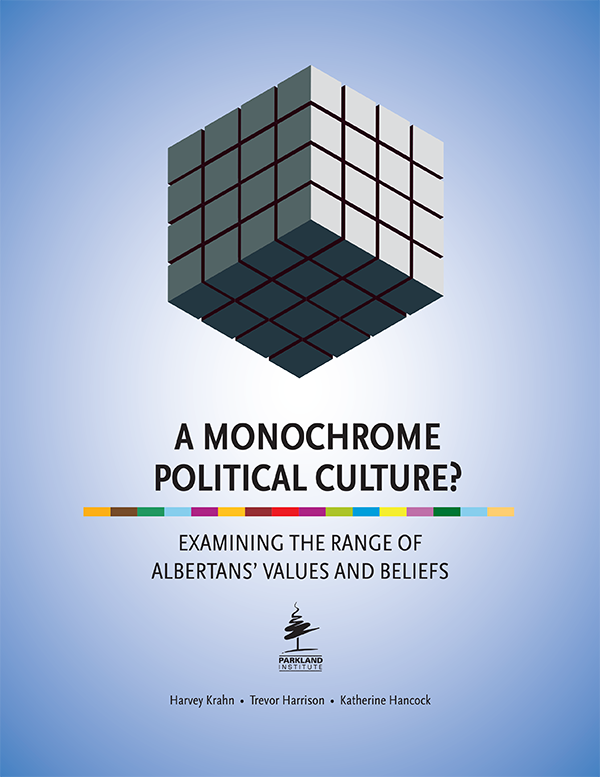 More generally, the survey results suggest that the spectrum of Albertans’ political values and beliefs, far from being monochromatic, reflect rather multiple shades of grey – even, perhaps, glints of genuine colour. Would realignment of the various parties into two achieve the full expression of these values and beliefs? We are somewhat doubtful. The report’s findings suggest instead the need to rethink more broadly the political system of representation within which the current political parties engage, and which may blunt the citizenry’s expression of difference.